This page is for those of us who have lost our beloved friends and wish to donate in their memory. Below are some of our permanent residents that have now left this world. We would like to dedicate this page and this poem in their memory. You remain in our thoughts and in our hearts. Run Free! 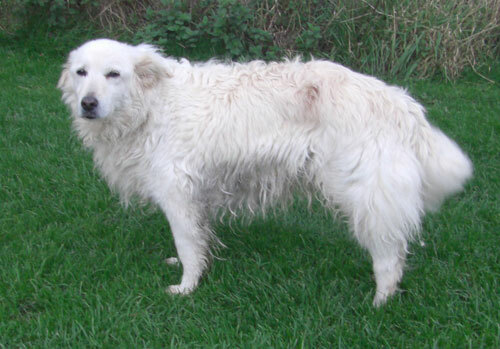 Grace came into rescue from the pound after a kettle of boiling water had been poured on her back. 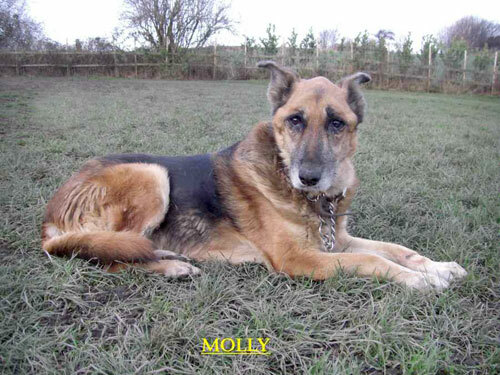 She lived her remaining time happily in a home with two other German Shepherds. 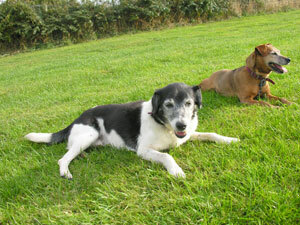 Molly came in to rescue with her brother Hugo after her owners could no longer keep her. She lived with Brian in his house and sadly died of liver failure. Hugo came in to rescue with his sister, Molly, after her owners could no longer keep him. 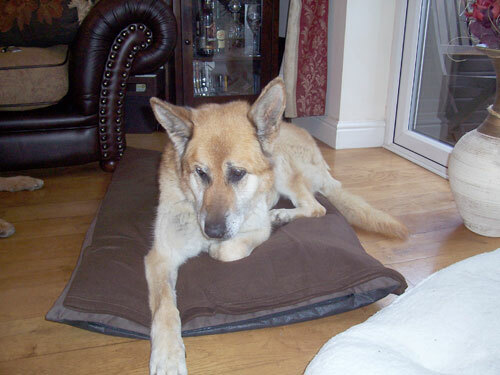 He lived with Brian and his sister until he developed a fatal tumour when he joined his sister at Rainbow Bridge. This is Little Bonnie (one half of Bonnie and Clyde). Both came to Whitehall after we were contacted by a lady who runs a pet taxi service asked why the lady owner was taking her dogs to the Vets and the lady said she was taking them to be put to sleep because she was moving house. Bonnie was a real little character and was nicknamed "Bonnie Barker". Sadly Bonnie passed away in 2008. This is Clyde (The other half of the Bonnie and Clyde team). 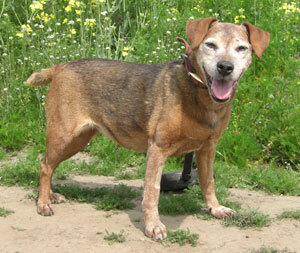 Clyde like his soul-mate was a real character and would in his younger days scale a 5 foot fence to be by your side. When Clyde passed away Bonnie missed him for a long time because they went everywhere together. They both lived out their lives at the Rescue even though Whitehall tried for many years to find a home that could take them both on as we felt it wouldn't be fair to split them up. 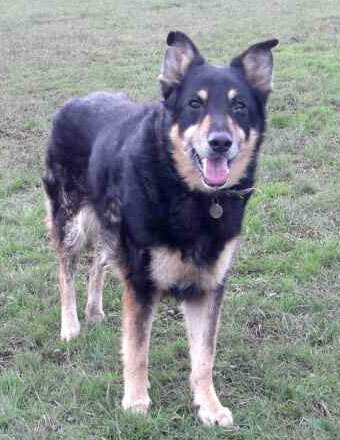 Often the older Dogs do get overlooked but they were happy at the Rescue as it was a better life than what they had had before they came to us. This is Little Oscar aka Oscie or Oscar Zig Zag. 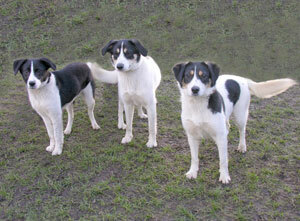 Pictured to the left of the photo with his Mother and Father who were abandoned on farmland and left to fend for themselves in the middle of winter. His mum was heavily pregnant and it took Whitehall 3 weeks to catch Jack and Holly because they were so traumatised. At 11 weeks of age Oscar was diagnosed with an inoperative liver shunt and it was suggested it would be kinder to put him to sleep but we did a bit more research with thanks to the vet and we got Oscar on a diet of Cottage Cheese, Bananas, Beetroot, Yoghurt and lots of potions and pills and he led a near normal life and lived every day to the full! Oscars Mum and Dad were rehomed to a lovely home together and would come back to visit him and they never forgot him nor did he ever forget them. Sadly Oscar Died in 2009 just before his 4th Birthday. In his short life he lit up the life of so many and was a true inspiration to us all because he showed us that given the cards you are dealt, even if its a bad hand, play on because they may turn out better than you first thought!